To help cover these costs there is an adoption fee of £60 per cat or kitten, it does not cover the cost of all of their treatment but it does boost the kitty. You will be able to reserve a cat when you visit and then we ask that you collect them within one week, during this time we will have contacted you by telephone to advise you on how to settle them in. A cat’s behaviour in their pen is not always a true representation of their real character.They are in an unfamiliar environment and may be taking time to get to know their new surroundings. For this reason some cats can appear apprehensive about saying hello but don’t let this put you off. Remember their whole world has changed. They may not understand that you could be the one to change it back again for the better. Be patient, it pays dividends.When you meet for the first time please take things quietly and slowly, allowing the cat to come to you. We have kittens at the adoption centre looking for homes, however they tend to find homes quickly so you will not find them on the website. We advise that you give us a call before you visit and we can let you know the details on who is available. We also let you know via Facebook if a litter is available. 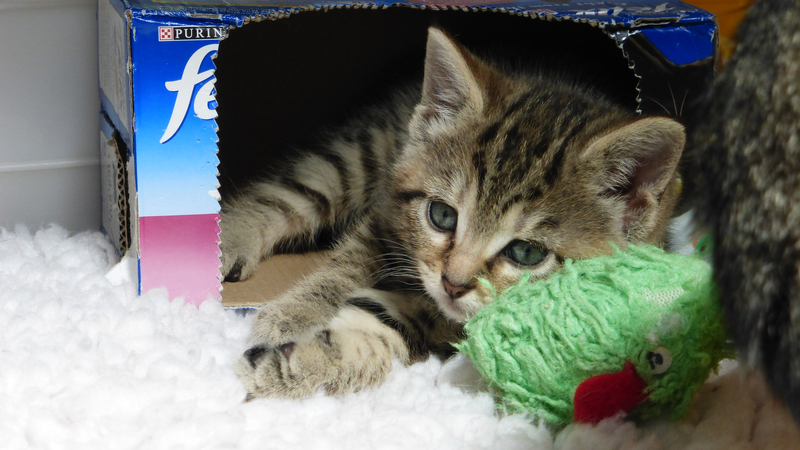 Kittens are only available for homing once they have been signed off by the vet as suitable to leave the care of mum, they are also neutered before they go home.